This is a rare and unusual 1857 U.S.C.S. 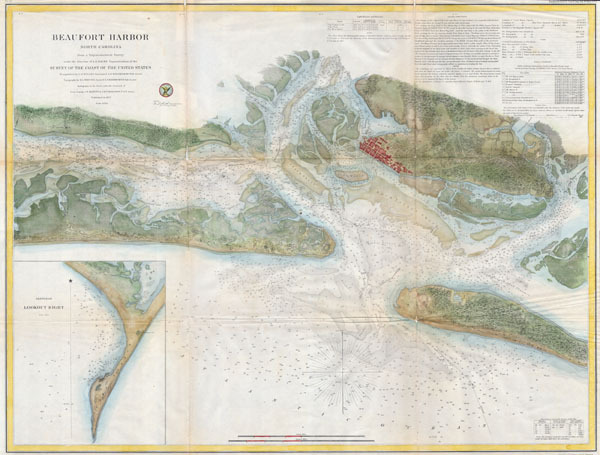 Map of Beaufort Harbor, North Carolina. Depicts the North Carolina coast from Carolina City westward through Beaufort as far as Lenoxville Point. Features superb inland detail of the region as well as innumerable depth soundings, indications of various shoals and breakers, and detailed sailing instructions. An inset map in the lower left quadrant shows Lookout Blight or Cape Lookout. This map was prepared under the direction of A.D. Bache for the 1857 edition of the Annual Report of the Coast Survey . The triangulation was accomplished by C. P. Bolles and A. S. Wadsworth. The Topography is the work of H. L. Whiting and A.S. Wadsworth. The hydrography was assembled by avarious parties under the Command of Lieutenant Commander J. N Maffitt and C. R. P. Rodgers. Very good condition. Minor verso repairs and discoloration on original folds. Top and right margins narrow but intact.